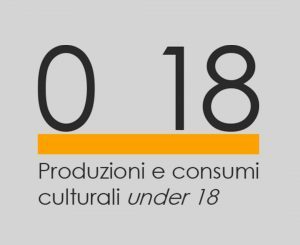 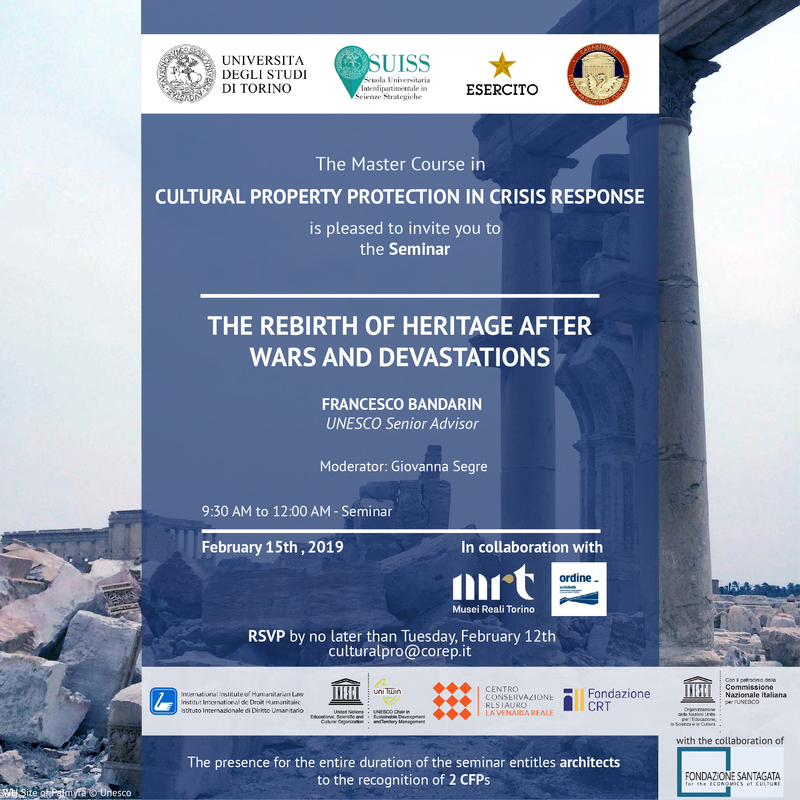 Fondazione Santagata presents, from February 15th to May 15th, a series of seminars held by teachers and experts in the field of cultural heritage protection during armed conflicts and natural disasters, aimed at deepening themes and models for a adequate management of cultural heritage in crisis scenarios. Seminars are held by leading experts in the field, including: Francesco Bandarin (UNESCO senior advisor and member of the Steering Committee of Aga Khan Trust for Culture), Edouard Planche (UNESCO Regional Advisor), Stefania Abakerli (World Bank), Webber Ndoro (Director-General of the ICCROM – International Center for the Study of the Preservation and Restoration of Cultural Property), Officials and experts of the Carabinieri Command for the Protection of Cultural Heritage and of the Command for Training and Application School of the Italian Army. 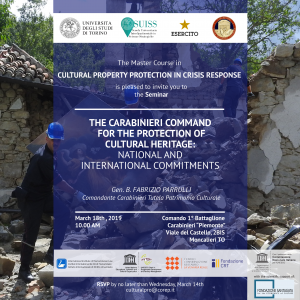 Topics discussed are all related to the protection of cultural heritage, from the legal-normative aspects required by international laws, to economic, political and managerial ones. 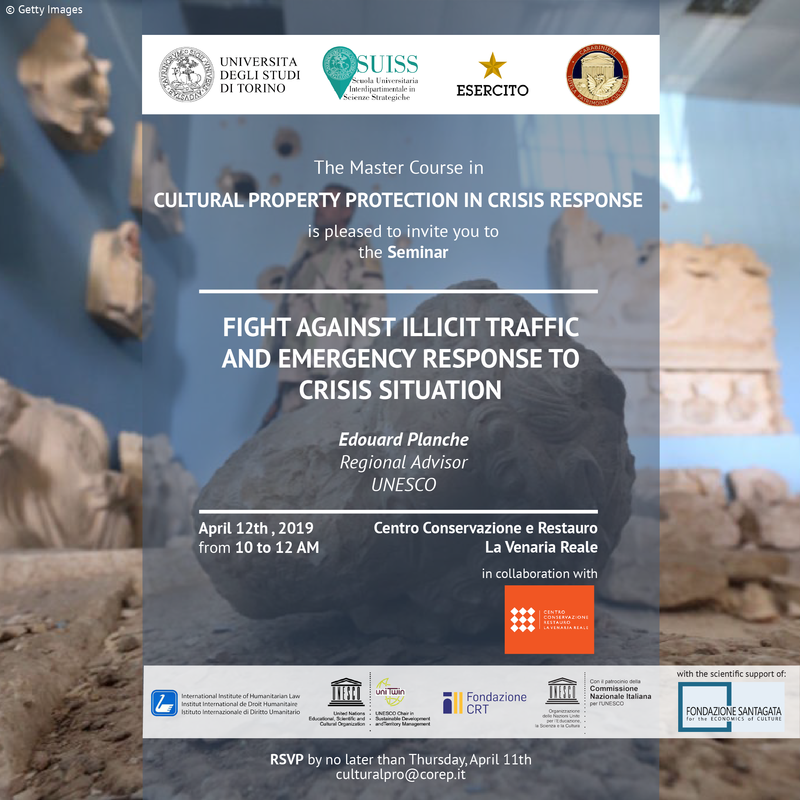 All the seminars are held in English, open to the public and to the 17 students enrolled in the Master in Cultural Property Protection, who come from 10 different countries. 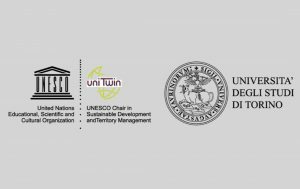 The activities and topics discussed during the seminars can be also addressed, above all, to university students, researchers, academics, professors, trainers, politicians, non-governmental organizations, journalists and architects. 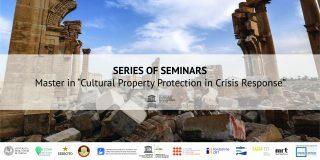 For the seminars that will be held on the days of 15/02, 15/03 and 5/4, there is the possibility that the architects are recognized of 2 CFP’s. 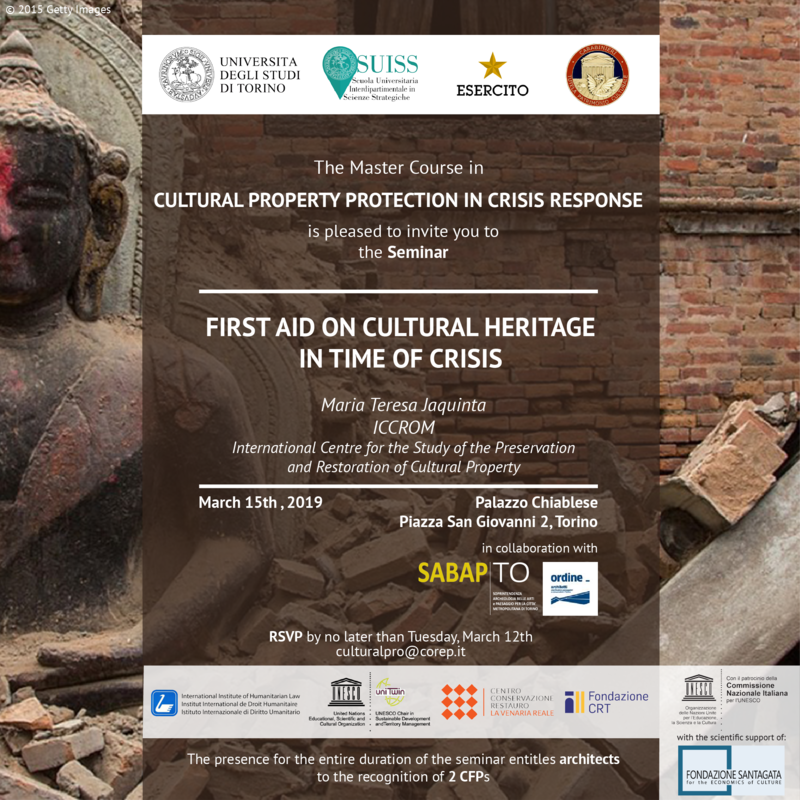 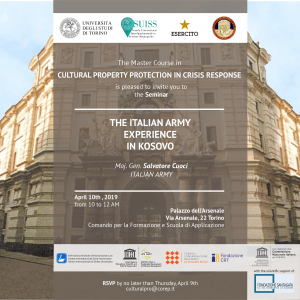 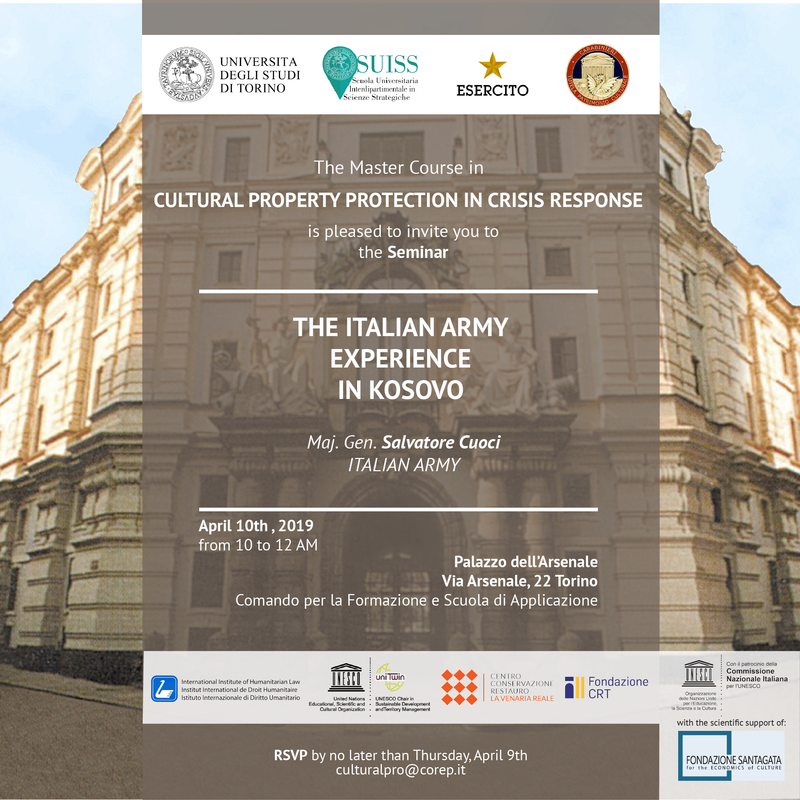 The series of seminars is organized in the framework of the International Master in “Cultural Property Protection in Crisis Response”, of which the Santagata Foundation is a technical-scientific partner, under the patronage of the Italian National Commission for UNESCO. 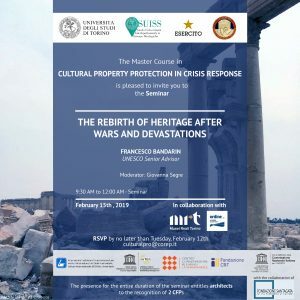 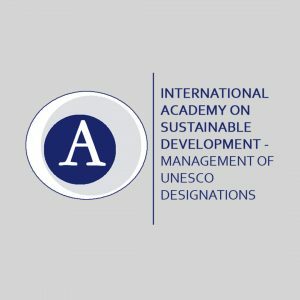 The aim of the series of seminars is to study and understand what techniques, policies and actions, to safeguard and protect cultural heritage, not only in areas affected by conflicts and war scenarios, but also in territories that have suffered the destruction of artistic and cultural heritage as a result of environmental disasters. The theme of cultural heritage protection is among the most current in international strategic and political agendas, as the definition of specific actions for the prevention and recovery of historical sites and entire cities is becoming more and more necessary. Among the areas most affected by the destruction of cultural heritage, we mention Syria, Nepal, Yemen, Iraq, where internationally renowned museums, monuments, places of worship and numerous UNESCO sites have been razed and looted. 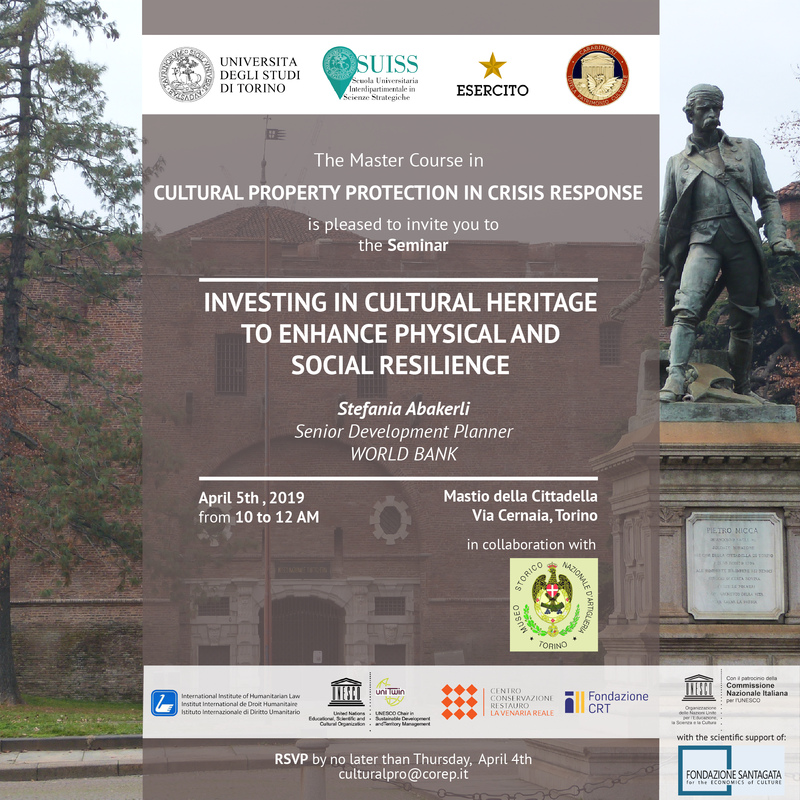 Topics discussed during the seminar cycle are consistent with UNESCO’s objectives of training, education, sustainability of cities and improvement of social conditions, as they focus on the training of experts who can act in emergency scenarios and are able to safeguard, to protect and recover the world cultural heritage, which contributes to the definition of the identity of peoples and communities.